Sabah Environment Protection Department (EPD), Department for Irrigation and Drainage (DID) Sabah, the SE Asia Rainforest Research Partnership (SEARPP), and the Human Modified Tropical Forest (HMTF) Research Programme’s LOMBOK Project (Land-use Options for Maintaining BiOdiversity & eKosystem functions) are jointly organising a workshop on the benefits of riparian buffers in Sabah today. 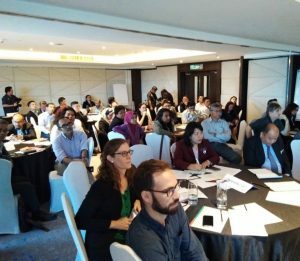 Fifty representatives from government agencies, local and international universities, civil society organisations, and industry players will converge at this workshop to exchange knowledge and explore options for the effective design of riparian buffers in Sabah. The workshop is officiated by Yang Berhormat Assaffal P. Alian, Assistant Minister for Tourism, Culture and Environment Sabah. Also present are the Ministry of Tourism, Culture and Environment Sabah Deputy Permanent Secretary Hajah Mariam Omar Matusin, Environment Protection Department Director Tuan Haji Mohd Yusrie Abdullah, Department of Irrigation and Drainage Sabah Deputy Director, Ir. Charles Yeo and SEARRP Director Datuk Dr. Glen Reynolds. Dr Matthew Struebig of the University of Kent, one of the lead investigators in the LOMBOK Project stated that the research results are based on a five-year collaboration between scientists in UK universities, Universiti Malaysia Sabah, and the Forest Research Centre in Sepilok, to study rivers in oil palm plantations in the south east of Sabah. With funding from the UK’s Natural Environment Research Council (NERC), the British Council, and the Malaysian Industry-Government Group for High Technology (MIGHT) via Newton-Ungku Omar Fund, scientists have established a network of biodiversity monitoring and carbon dynamics plots within riparian buffers to test the effectiveness of riparian reserves. In particular, they have been investigating the effects of the quality and width of riparian buffers on water quality, aquatic and terrestrial biodiversity, and carbon fluxes. Permanent rivers in Sabah that are more than 3 metres wide require a vegetation zone of at least 20 m from each riverbank, as provided under the Sabah Water Resources Enactment (SWRE) 1998. This regulation is designed to protect water quality, water quantity, and aquatic environments. There are other regulations, such as Sabah Land Ordinance (Cap. 68), Sabah Environment Protection Enactment 2002 and Sabah Forest Enactment 1968, which allow for increasing riparian widths beyond the minimum 20m set by the SWRE 1998. Strengthening the effectiveness of riparian reserves is crucial for improved landscape connectivity as well as the protection of important ecosystem services such as carbon sequestration, water quality and water quantity.